Hi there. This post is a quick summary of few things have been working on over the past six months. Things were quite busy over here! Our main project was developing a new 2D rarefied gas / plasma solver called Starfish. This effort was funded by NASA/GRC SBIR Phase I effort for which we are extremely grateful. Starfish was designed with the goal of supporting Glenn Research Center’s high power Hall thruster program. However, instead of developing just another Hall thruster code, we decided to develop Starfish in a modular and general fashion. As such, Starfish is really a general 2D solver that includes the components necessary to tackle the Hall thruster problem, but at the same time, is also applicable to completely different disciplines. Some possible applications include plasma processing, non-equilibrium plasmas, the plasma-wall interface, rarefied gases, contamination transport, electrostatic return, atmospheric discharges, and any type of electric propulsion analysis. 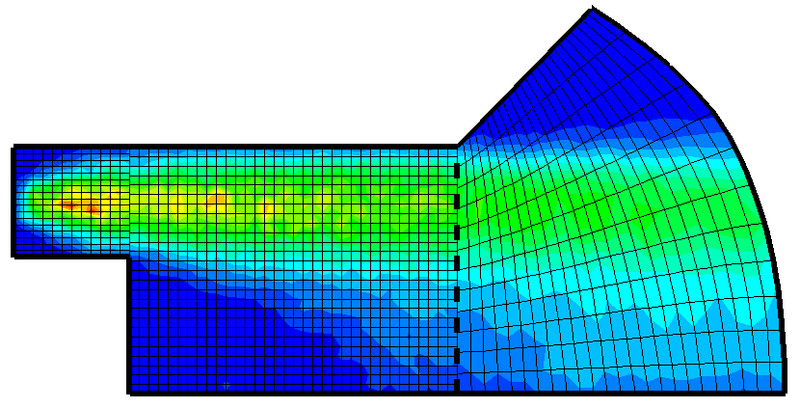 Some of the important code features include support for multiple meshes, surface geometry defined by linear or cubic splines, arbitrary number of kinetic (PIC) or fluid (CFD/MHD) species, inter-material interactions including chemical reactions and collisions, and a detailed wall interface model. The code also couples with out kinetic code Lynx for self-consistent computation of electron transport. As part of this work, we were also interested in designing a logo, which you can see on the right. The logo was developed by Glenn Fletcher, and in it he captured the fact that Starfish is a 2D solver with many application areas (i.e. the multiple arms of a starfish). Figure 1. An example Hall thruster simulation using Starfish and a demo of Starfish’ support for multiple meshes. The domain in second figure consists of two rectilinear and one elliptic mesh. The demo shows an ion plume under a constant electric field. You can find out more about Starfish on the code page, particleincell.com/starfish. We will be posting many articles in the near future demonstrating the various features of the code so make sure to subscribe to the newsletter. We are also currently looking for beta testers so please let us know if you are interested. We would love to hear from researchers in the industry, academia, and the government working on actual plasma problems that could benefit from a two-dimensional analysis. As part of this testing, we want to make sure the code captures the needs of you, the customer. Unfortunately due to us playing it safe with ITAR, for now the code is available only to U.S. persons residing in the United States. We do plan to release the code in some form to a wider audience in the future after consulting with experts in the export law. Figure 2. Ion flow near a wall in the presence of a inclined magnetic field. The ions flow parallel to the wall or are even repelled and at no time does the velocity reach the sonic Bohm speed as is the case with a regular sheath. 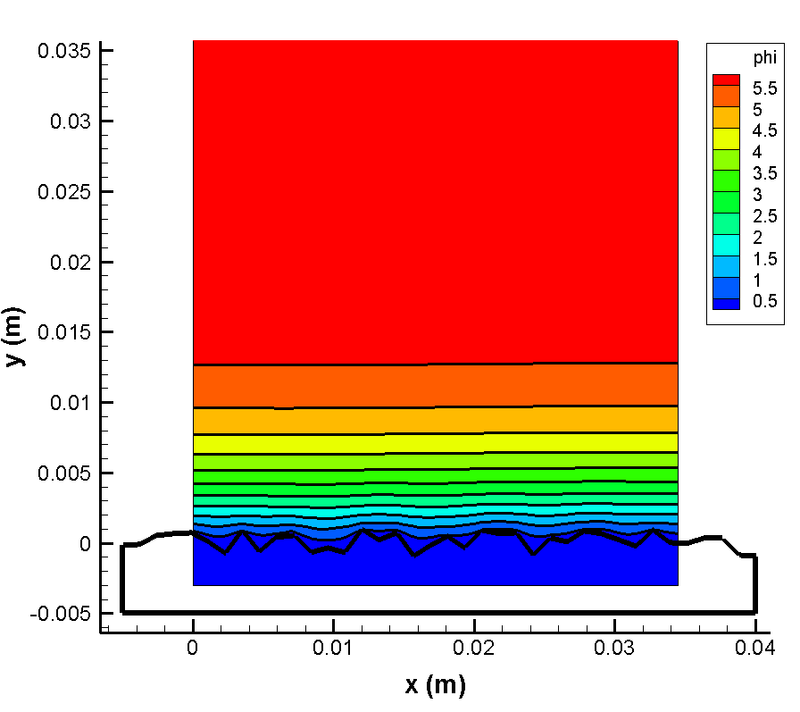 In addition, we started supporting numerical analysis of a plasma-wall interface experiment being conducted at Georgia Tech under AFOSR funding. 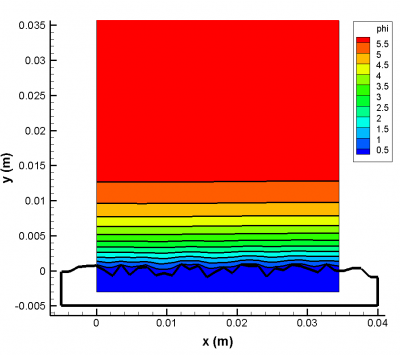 This experiment aims to obtain a better understanding of the plasma-wall interface, and determine how surface material properties, secondary electron emission, and magnetic fields impact the formation of the sheath. The figure below shows that surface irregularities quickly become smoothed away in the sheath. This result also demonstrates the code’s ability to load relatively complex geometries. Figure 3. Plasma potential near a rough wall, computed with Starfish. 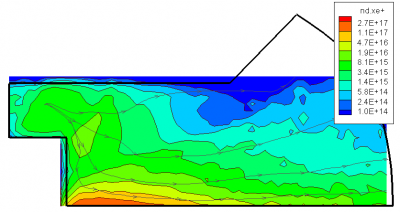 Finally, we also worked with a California-based CFD company to enhance their Java-based GUI by incorporating VTK-support for data visualization. That’s all we can say about this project for now. However, in the near future we will start work on jVTE, a Java reincarnation of capVTE. This effort will lead to a light-weight, Java based VTK visualization solution that can be used either in a standalone fashion or coupled with existing solvers. Stay tuned and let us know if you are interested in this technology. I hope you can raise more money for the Glenn Research Center. The work you are doing on starfish is so groundbreaking. Thanks Bill! That Phase I was a great seed funding and allowed us to get most of the grunt work done. But now I feel that is better to develop the rest of code with internal funding as that should give us bit more freedom in the final direction we want to take the code. At this point we are still developing some of the basic features (such as DMSC, various potential solvers), so the applications are not too Hall thruster specific right now. But as soon as those are done and the code is released, we will turn the focus back on Hall thrusters, and hopefully get some additional support from Glenn and other centers. And if not financial, we should at the least be able to start some collaboration. I hope you can write a document about how to get started with the Starfish in detail. And I will appreciate that very much. Hi Mike, a Starfish User’s Guide is on my short list of things to do. Starfish is a brilliant piece of work! I am trying to use it to simulate a simple ion thruster operating in the ionosphere. What would be your recommendations for the xml file inputs for a basic Xenon ion thruster plume, and the associated interactions? Hi Shaun, in my master’s thesis work I used a Maxwellian source to model an ion thruster. I think something like that should still work. Thanks Lubos, I use a Maxwellian source of Xe+ ions and have MCC and DSMC collisions turned on, but the output appears to be just that of a uniform beam with no observable CEX cloud. The electron density also stays constant over the entire domain. Any idea to what I am doing wrong? Do you have neutrals? It may be easiest to email me your input files and I’ll take a look over the weekend. I have experimented with adding slow moving neutrals, but that does not seem to work. That would be fantastic if you can have a look via email. What is your address? I have not yet tried Starfish, but it looks like a very useful project! One question I have is on the implementation of time varying boundaries. My quick look at the documentation suggests it’s easy to set up a Dirichlet boundary with a set voltage. Is it possible currently to prescribe a changing potential? Hi Grant, that functionality does not currently exist but I agree that it could be useful. I will try to implement it in the near future.